Since this lake is shallow, it has experienced ongoing problems with weeds (especially near the shore line), and accumulated organic sediment has become a pressing issue. 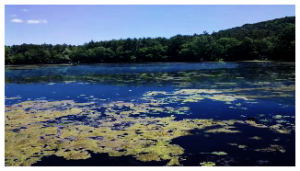 Over the years, the algal and weed blooms, ongoing herbicide applications, and resulting residue from die-offs has resulted in considerable bottom sediment problems. “Bio Lake Sludge Buster” for Sludge Reduction. 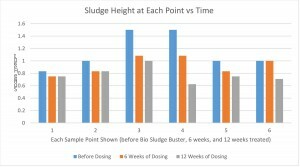 BLSB, a prepared blend of sludge digesting beneficial bacteria and probiotics, has been used successfully around the world to solve sludge build up problems. In this situation, with a known sludge problem around the lake, the authorities chose a specific section of the lake to test the sludge reducing ability of “Bio Lake Sludge Buster” from OES. 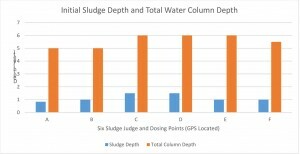 Note that the sludge height was reduced at each sample point. 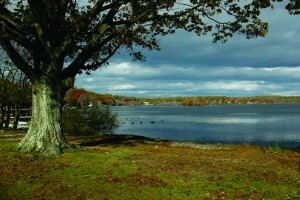 The reduction ranged from 10% to 58% with an average reduction of 29% in just three months of treatment.Particularly important is that the treatment area was not cordoned off or otherwise separated from the rest of the lake. 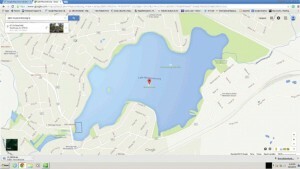 While the defined treatment area was 3 acres, the product applied to this area was diluted to the rest of the lake. 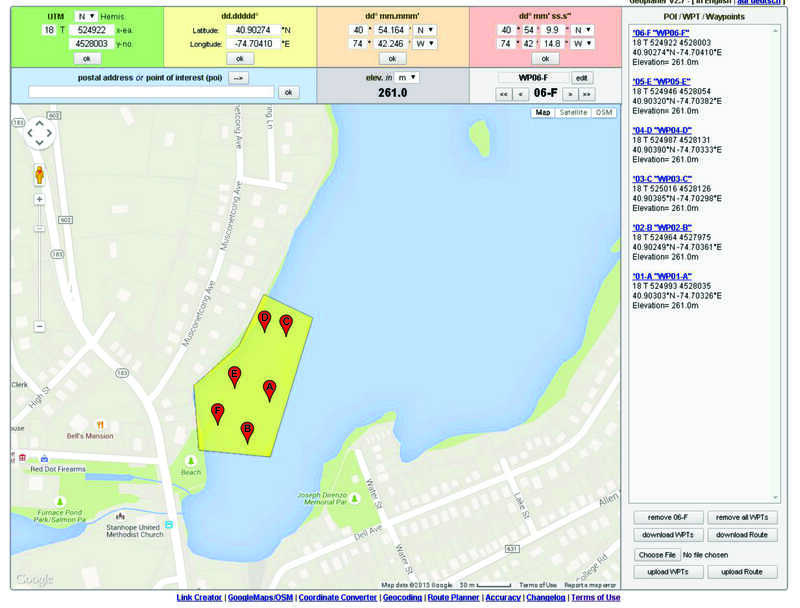 This means that the treatment ration (275 gallons per 3 acres per week) should be adjusted downward considerably when scaling up to full lake treatment. With full lake treatment, the product is applied in the desired section without dilution, while the test site allowed product to flow away. 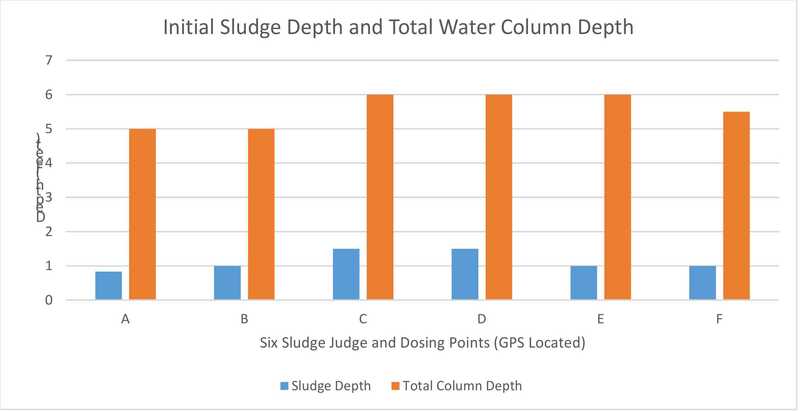 Based on our experience, the comparable treatment rate to achieve 30% reduction of lake sludge in 3 months in a fully confined treatment zone would be 275 gallons per week per 10 acres. 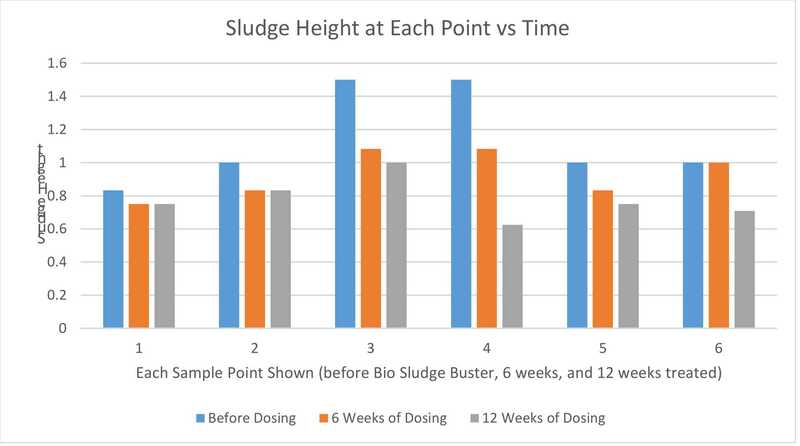 If the dosing period could be extended to 6 months, the typical rate would be 275 gallons per week per 15 acres. 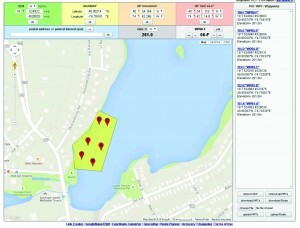 The total depth of the lake varies slightly over time depending on rain, river flow, etc., and at the beginning of the trial, the total water column depth average across the 6 samples points was 5.6 feet, compared to 5.8 feet at the end of the 12 week trial period (September 29, 2015).